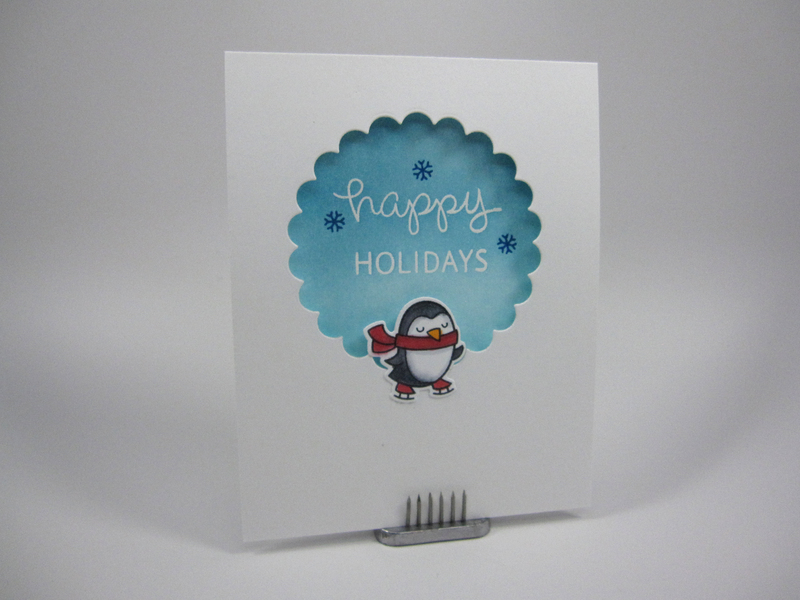 Today, I decided to create a Holiday card without a lot of the bold, bright colors associated with Christmas. I love the Hero Arts stamp I used in this card. The stamp is a delicate fine-lined drawing of bare winter trees. The simple graphic style of the stamp’s image really does convey a sense of quiet and peace in the dead of winter. I first stamped the image in gold ink onto white 80 lb. cardstock and trimmed it down a little and mounted it on gold metallic cardstock. 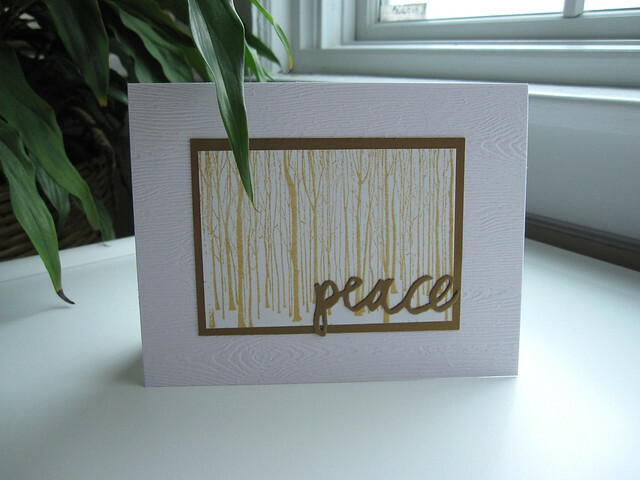 I then centered the whole think onto wood-grained paper and mounted everything onto a top-folding A2 card base and added the die-cut brushstroke ‘Peace’ sentiment. Love this brushstroke die. I’m pleased with the simple, minimalist layout of the card made with a minimum number of supplies The gold Delicata ink is gorgeous. The photo doesn’t do justice to this beautiful gold, shimmery ink. Supplies used in making this card: Stamps: Hero Arts Winter Trees Pattern; Inks: Tsukineko’s Delicata ink in Golden Glitz; Cardstock: Neenah Solar White 80 lb. and 110 lb. 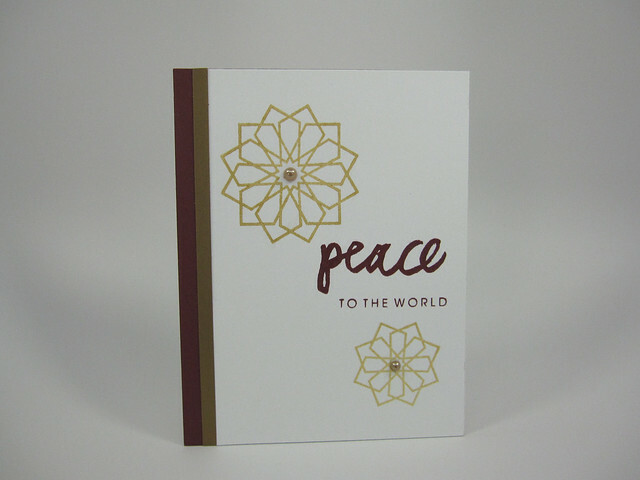 papers, Stardream Metallic in Antique Gold, Essentials by Ellen Woodgrain Embossed 110lb in white; Die: Essentials by Ellen Designer Dies: Brushstroke Peace by Julie Ebersole. 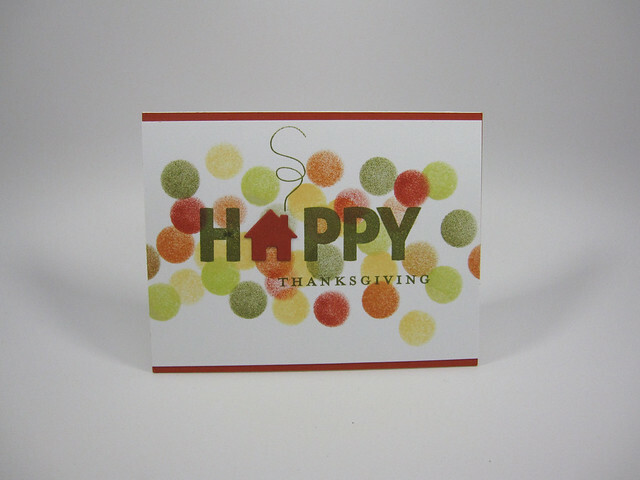 This is another card I made using stamps from the Essentials by Ellen Holiday 2014 release. I love the Santa with the shades! He’s such a cool dude. It looks like Santa took a bite out of the poor gingerbread man while sipping some hot chocolate. I die cut a 3-opening film strip using Pretty Pink Posh’s die and PTI’s Pinefeather cardstock. I stamped the images onto white cardstock. 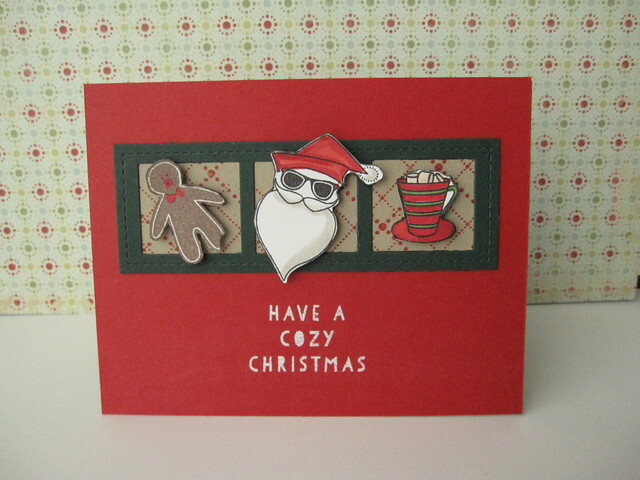 The gingerbread man was stamped in Memento Rich Cocoa ink and the other 2 images in Memento Tuxedo Black ink. All images were colored using Copic makers (I only colored Mr. Gingerbread man’s eyes, mouth and bow tie in red). After coloring, I fussy-cut the images. The backing to the 3-opening strip is a piece of kraft cardstock cut down to the same size as the strip and then stamped in red ink using the argyle-patterned background stamp. After adhering the backing to the film strip, I mounted the fussy-cut images onto the strip using small dimensional foam dots. Then I mounted the strip onto a 4.25” x 5.5” piece of red cardstock. This entire piece was mounted onto an A2 top-folding card. 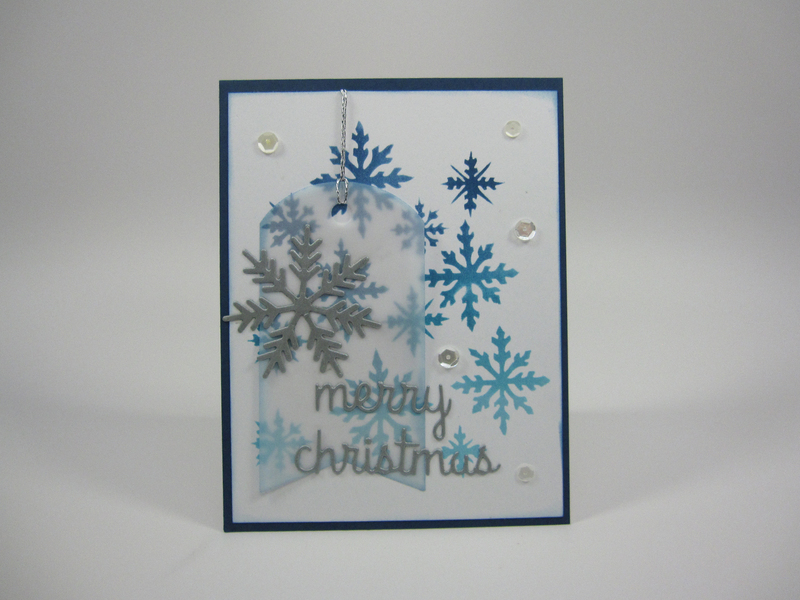 The sentiment was stamped using white craft ink. Supplies used in making this card: Stamps: Essentials by Ellen’s Tis the Season stamp set by Julie Ebersole and Cozy Christmas stamp set by Julie Ebersole; Impression Obsession’s Dotted Argyle background stamp. Cardstock: Papertrey Ink in Pure Poppy ,Pinefeather and Kraft; Neenah Solar white 80 lb. ; Neenah Solar White 110 lb. (for card base). Inks: Memento inks in Rich Cocoa and Tuxedo Black, Stampin’ Up Whisper White craft ink. Other Supplies: Dies: Pretty Pink Posh’s Stitched Film Strip Die; Copic Markers; dimensional foam dots. I received an early Christmas present this year! Santa gave me the entire Essentials by Ellen Holiday 2014 Release. This was the first card I made from the release. 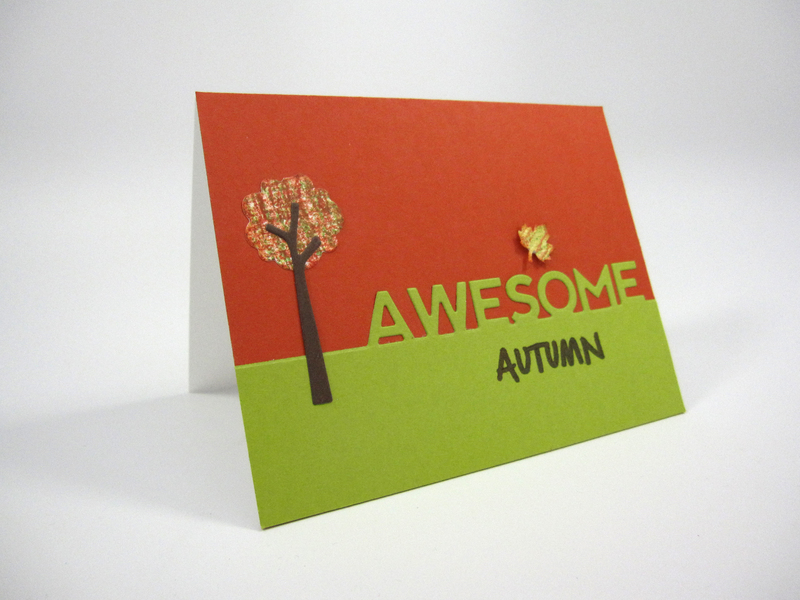 The images were designed by Julie Ebersole one my favorite cardmakers. Julie’s humor in videos always makes me laugh! The images and dies in this release are gorgeous. 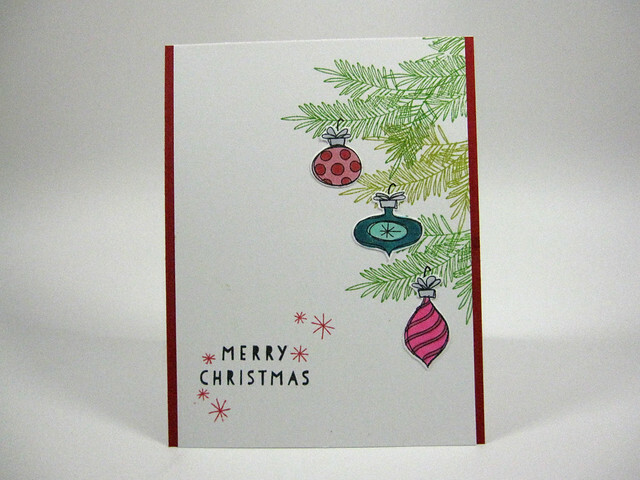 I especially like the delicate lines of the ornaments, evergreen branches and sentiment in the two sets that I used. I don’t know how to describe it but the stamps in this release have both a delicate and whimsical feel to them. 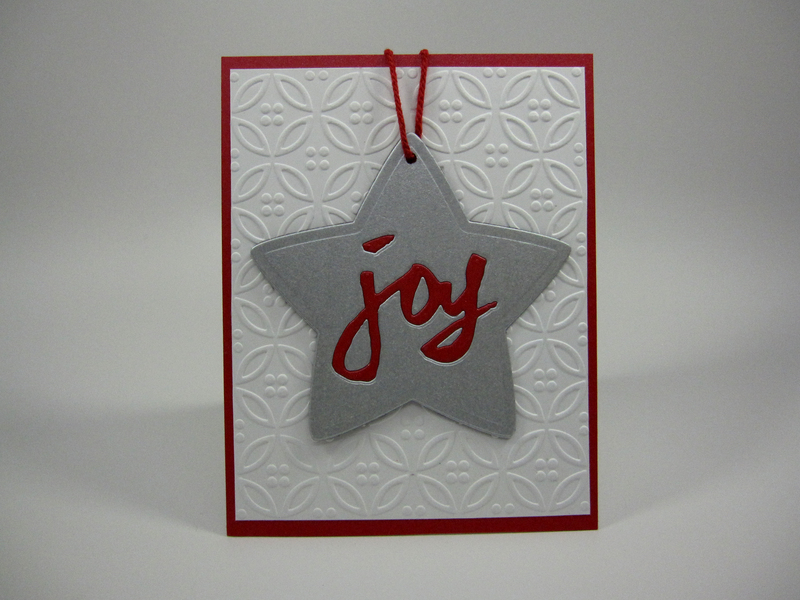 Love this release and I’m going to love making Holiday cards using them. 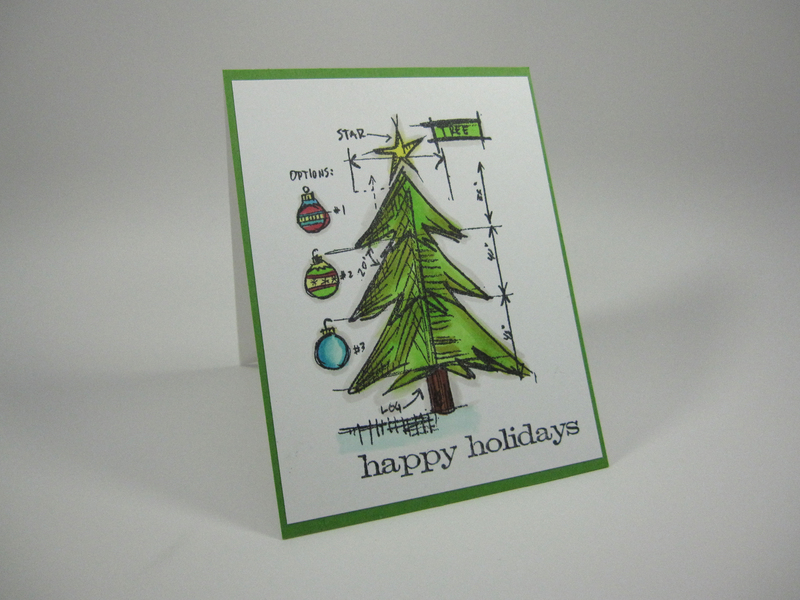 I stamped the evergreen branches in 2 shades of green to give a feeling of dimension. On a separate piece of white cardstock, I stamped the ornaments using Memento Tuxedo Black ink because I knew I was going to use Copic markers to color them. I colored the ornaments first and then fussy-cut them. The ornaments were flush-mounted onto the card and I drew small hooks using a fine-tipped black artist pen so the ornaments looked anchored to the tree. The sentiment was stamped in archival ink and I added a few sprinkle image from the stamp set in red ink to highlight the “Merry Christmas” sentiment a little bit more. Supplies used in making this card: Stamps: Christmas Scribbles stamp set and Cozy Christmas stamp set (for the sentiment) both sets are from Essentials by Ellen designed by Julie Ebersole; Cardstock: Neenah Solar white 80 lb for card front mounted on Papertrey Ink: Pure Poppy and then mounted on Neenah Solar White 110 lb for card base; Inks: Papertrey Ink: New Leaf , Simply Chartreuse and Pure Poppy; Ranger Jet Black Archival Ink (sentiment); Memento Tuxedo Black Ink (for ornaments); Other Supplies: Copic Markers, and Faber Castell Pitt artist pen in black. This is a Thanksgiving card I sent to family members this year. My original idea did not include the use of a bokeh effect. I first stamped the sentiment, ‘H * appy’ and found that I wasn’t getting the solid coverage I wanted. To counteract the splotchy sentiment I used small sponge daubers in an array of autumn colors to create bokeh dots over and around it. I die cut the house twice from a coordinating die set and then glued the 2 pieces together and mounted it where the ‘A’ should appear in the word ‘happy’. I added the little smoke swirl coming out of the house’s chimney. The smoke swirl is from another stamp set (see below). The photo doesn’t show it very well, but I used my clear Wink of Stella pen to go over the house to add a little shimmer. I really like the final effect even though this wasn’t the original design I was going for. Supplies used in making this card: Stamps: Avery Elle’s Fill In the Blank, Papertrey Ink’s Year Round Happiness, Essentials by Ellen’s Cozy Christmas by Julie Ebersole (for smoke swirl); Inks: Papertrey Ink in Ripe Avocado, Limeade Ice, Terracotta Tile, Canyon Clay and Harvest Gold; Dies Avery Elle’s Icon Fill in the Blanks Elle-ments dies (for the house); Papers: Neenah Solar White 80 lb. for the card front, mounted ontp Papertrey Ink cardstock in Terracotta Tile, mounted onto a card base using Neenah Solar White 110lb. cardstock. Other supplies: Tsukineko Sponge Daubers, Wink of Stella pen (clear).